WE WANT TO HELP YOU SLEEP COMFORTABLY AT NIGHT WITHOUT WORRY. As financial experts in the Southern California area, we know a lot about money, and we’ve talked to all kinds of people who wield vast fortunes, and many others who have almost nothing to their name. But regardless of where you are financially, there’s one thing that most people have in common — we all like movies. Sure, there are exceptions, but it’s safe to say that the majority of people like to watch movies from time to time, and films are a great way to teach lessons, inspire people, and contemplate your life. 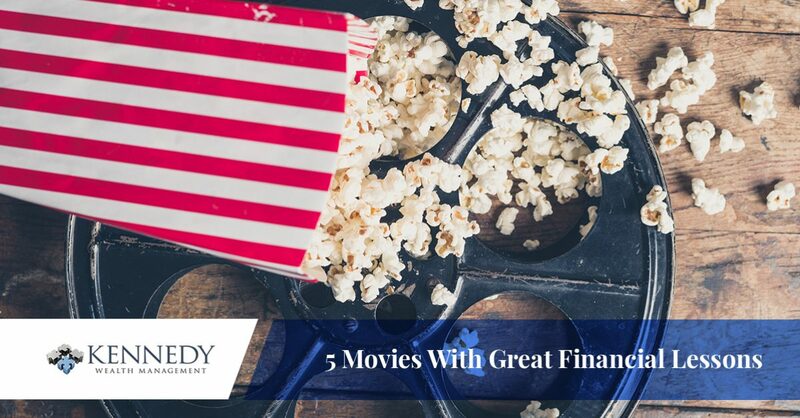 Good storytelling can bring ideas and thoughts to light that you never would have considered before, and that’s why, if you want to get better at managing your money, it’s not a bad idea to watch some of the best films that are based around money. At Kennedy Wealth Management, our team of financial advisors helps countless clients to build their retirement income plan, which requires smart financial decisions and wise preparation. Let’s take a look at some movies that teach valuable monetary lessons — whether it’s on what to do, or what not to do. The Big Short focuses on the financial crisis of 2007-2008 caused by the housing market, and the exploits of a few select people who saw the writing on the wall before it happened. While this movie is about money on a much larger scale than your retirement income fund, we like it because it does a good job at explaining complex financial concepts in layman’s terms. That is the main purpose of The Big Short — to break down concepts to the public at large who don’t understand all the financial jargon that’s thrown around when experts talk about the recession. This is also a movie about the corrupting power of money, and how the greed of a few can lead to the detriment of many. One moment we love in The Big Short is when a few young adults revel as they realize they’re going to make millions from shorting the housing market, only to be strongly reprimanded by an older, more experienced senior who reminds them that their gain is a result of larger actions that will ultimately bankrupt millions of Americans. The biggest thematic message here is being humble with your money. When we think of the word “social network,” there’s one name that springs to mind — Facebook — and that’s exactly what this movie is about. The film covers the creation and propagation of Facebook in its earliest days by Mark Zuckerberg, and a series of resulting lawsuits which claimed that the titular social network was a stolen idea. A film critic will tell you that this is a movie about relationships and the dangers of being recklessly ambitious. However, a financial advisor will tell you that there are some important monetary lessons here, as many grievances between the characters could have been avoided if they took proper legal precautions. This is a movie about entrepreneurship, and the dangers of not taking the proper legal precautions of launching an idea. Many of our clients are successful businessmen who are looking to manage their hard-earned income — their lives would be much harder if they had hired lawyers at the right moments and protected their ideas and intellectual property with contracts, paperwork, and documentation. You’d probably be hard pressed to find a financial expert who hasn’t seen Wall Street. It’s a favorite among finance professionals, and it tells a compelling story of an aspiring stockbroker in New York who is desperate to get under the wing of ultra-successful stockbroker Gordon Gekko. In the end, it’s more than he can handle as he’s pressured into illegal activity to make more and more dollars. This results in an insider trading scheme that spells disaster for the film’s characters, laying out clearly what can happen when you get too greedy. When you see the fate of the characters, it’s overwhelmingly apparent that greed is not good, and that making your money honestly and sincerely is the best path to a fulfilling life. When planning your retirement income, don’t resort to illicit methods to gain money in a way that’s fast and easy — be happy with what you’re building, and know that you don’t have to be a billionaire to enjoy your life. It’s hard to mention Wall Street without also discussing The Wolf of Wall Street. While the former is a fictitious tale inspired by a composite of various people and events, the latter focuses on the life of Jordan Belfort, a real stockbroker who landed prison time due to his predatory deals which landed him fat checks while leaving his clients penniless in the long run. The movie focuses on Belfort’s exuberant and life in New York as his riches quickly grow to unthinkable margins — but nothing lasts forever, and Belfort ended up receiving his comeuppance. The biggest financial lesson to be learned from The Wolf of Wall Street is to not be tempted by shortcuts and instant gratification. In almost any situation, you can always make more money more easily by resulting to unethical or even illegal methods. This Scorsese film shows that while this may work for a time, it’s an unreliable foundation to build your fortune off of. If you engage in investments and stock trading, it’s important to know Jordan Belfort’s story and to learn from it. Most of the movies on this list have been bleak affairs that are cautionary tales warning against greed and excess, so let’s end this on a happier note — The Pursuit of Happyness, based on a true story, follows the endeavors of Christopher Gardner, a man who just can’t seem to catch a break supporting himself and his son. Gardner goes through tremendous lengths to create an income for himself, working tirelessly day and night while also trying to be a good father. You might find yourself teary-eyed as you near the finale and start to see Gardner’s efforts pay off, as he learns the ropes of being a stockbroker. When all is said and done, this ends up being a rags-to-riches story that ends up being an empowering tale about the power of hard work and diligence. Christopher Gardner is in many ways the antithesis of The Wolf of Wall Street’s Jordan Belfort. This is a man who had nothing, who worked long and hard to create an income for himself. He played the game honestly, always putting integrity first and never seeking shortcuts. This led him to an incredible fortune, teaching that even tremendous amounts of riches are possible without having to resort to unethical means. Movies can do a great job at evoking certain emotions and helping us to consider where we are and what our goals are. We hope that, by watching certain movies on this list, you have a better understanding of where you sit financially, and we would encourage you to stop by our wealth management office in Calabasas. Our main focus is retirement income planning, and we want to help you to utilize some of the lessons mentioned in this article to build a sizable retirement income for yourself in your elder years. Finances can be hard work, but at Kennedy Wealth Management, we’re up to the task. Contact us today! Get Your 2nd Opinion Now! Fill out the information below for a free consultation. © 2019 Kennedy Wealth Management - All rights reserved.